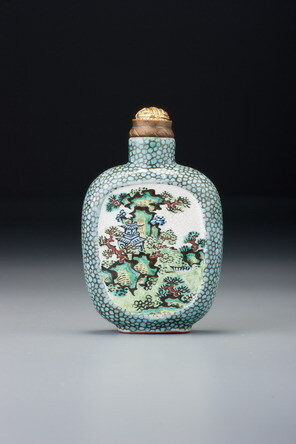 It is reasonable to conclude that the Jiaqing or early Daoguang are the most likely periods for Yixing bottles of this shape because, although we cannot be sure at what point the form evolved, we do know from the series of identical forms decorated with Pekinese dogs and doves (see Sale 3, lot 110) that it was used in the Daoguang period. The appeal of the decoration lies in the manner in which the wild but controlled modulation in the outlining brushstrokes and the quick but sure placement of the minor strokes brings these formulaic elements to life. The panels are surrounded by a design that is intended to imitate shagreen. With its rough surface polished down, shagreen was a tough and attractive material, and it appears in simulations at both Jingdezhen and Yixing at about the same time in the mid- Qing period. The shagreen ground is masterfully done and has obviously received the artist’s full attention. 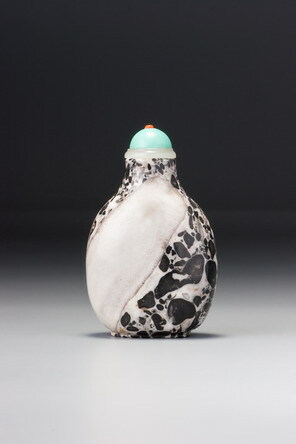 The cells vary in size and shape and are drawn with extraordinary care. Subtle variations in the glaze beneath create areas of dark and light that mimic the natural material.